I FINALLY FINISHED MY FIRST KNITTING PROJECT!! Can we talk about how exciting that is?! I have been working on it since May and, being that the project was a blanket, it took quite a while. But now it is DONE and I couldn't be happier with how it turned out! Is it perfect? Not even close, but it's done and I made it! And I learned some things along the way. So let's talk about that! 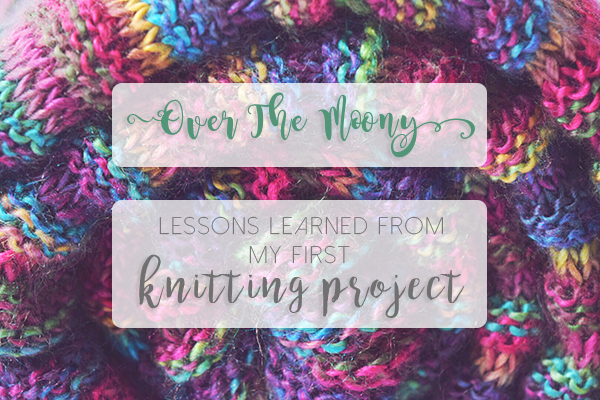 And I think that these lessons can really be applied to any hobby, not just knitting. It's rare that things come naturally (unless you're some sort of prodigy), so anything new is going to take practice and patience. The patience part is tough sometimes but I promise it pays off! When I began my knitting class, we were making hats. Hats are fine. It's good to learn how to knit in the round, but we had limited yarn to choose from since the teacher put kits together and we chose from one of the kits on our first day. I got a green camouflage-type colored yarn that I liked initially, but the more I worked with it I actually began to have a lot of hatred for it. It made me angry, which I'm sure seems incredibly crazy. It probably was because I associated it with a terrible learning experience (read about that here), but also because it just wasn't something I was looking forward to using. The yarn itself was ugly to me and the "pattern" I was trying to create looked awful. I wanted to make something pretty! All of the knitting magazines and the pins on Pinterest show such pretty things and that's what I wanted to make. Granted, my teacher was of a different generation and actually would make things out of necessity, not just frivolous pretty things for the sake of pretty. When the class was over and I could go out and do whatever I wanted to do without anyone attempting to embarrass me in front of a classroom full of people, I picked up pretty yarn that I fell in love with at Michael's. It was Unforgettable Yarn by Red Heart Boutique in the color Stained Glass. It was 100% acrylic, which my teacher 100% hated, but I didn't care! I liked it and that's all that matters. I found this free blanket pattern hanging on an end cap that I really liked as well, so there was my project! And I was excited to work on it every day. It never was a chore for me. It was fun, which is, at the end of the day what a hobby should be! Whether it's knitting or crocheting or drawing or painting or playing video games or collecting stamps, your hobby should bring you joy. 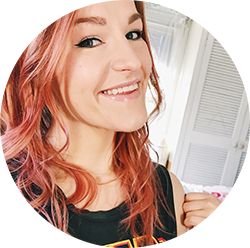 Of course it's going to stress you out a little bit (hello Mario Kart, I see you there), but at the end of the day it shouldn't feel like a chore. As I mentioned, while making my hat I was just willy-nilly trying to make a pattern and it turned out absolutely awful. I didn't have much guidance from the teacher other than knit a couple inches at the bottom and then start the pattern you want to start until it just about fits your head and then start to decrease so you can close it at the top. I never got that far because I wasn't a fan of what was happening. I think I was doing maybe 11 knits and 7 purls? I don't remember. But it looked terrible. Once you have a better grasp on the different stitches and how things come out then you can maybe try to do your own thing. Obviously you just need to know how to knit and purl, but then there are a million other things you can do with those two things. Get a good grasp on the basics and then branch out. This can go for anything really. Take drawing for example, which I am not the greatest at for this very reason. When you're first learning how to draw (and even if you're a pro), you need those guidelines on the face to know where to put your eyes and nose and mouth. It helps to see what direction your character is looking so that everything is in alignment. Only once you're very seasoned at this can you really freehand it, but I even see seasoned illustration vets using these guidelines when I get sketches at Comic Conventions. The basics are the basics for a reason: they're there to help you. Don't take them for granted! When you're first starting out, things are going to be frustrating, especially if you don't have any guidance. If you're just trying to learn from YouTube, it can be very tough when you don't have someone there to kind of hold your hand through the beginning and address your specific question or situation. And, even when you do know what you're doing, you're still going to drop stitches or slip stitches you don't mean to stitch, or add a stitch you don't want. You're going to run into a mistake that you made that you don't know how to fix. You're going to get frustrated when you can't find a video or an article that addresses your problem. You know what's best to do? Walk away. Like for a long time. Maybe the rest of the day, or at least until you absolutely know that you've calmed down and your frustrations have 100% subsided. Let's talk about an example that actually happened on the project I'm currently working on (sorry if this is cheating!). I was working on a blanket when I had an issue where a long strand of yarn was spanning across a couple stitches when it should have been worked into the blanket. Everything I tried to Google or Pinterest or YouTube was about dropped stitches but I know that wasn't what the issue was. I tried to back knit and take out a couple of rows to fix the problem but it didn't work. I had stepped away for a while but came back and kept getting angry. When I couldn't find a solution, I ripped the entire 8 inches that I had worked apart, only to find a solution to my problem the next morning. So. That being said, walk away when you get too angry. You'll thank me later. As soon as I started knitting I wanted to knit all of the things. I wanted to know about all of the things that I could knit, so you better believe that I pinned all the things! And I followed all of the Instagram accounts! And I watched all the YouTube videos! I wanted to knit all the time and I didn't want that feeling to go away. So I sought out all sorts of projects that I could do. I started watching how to do more advanced stitches so I could aspire to other projects. I always want to put something new on my needles and have a project or two brewing on the back burner! Hence my possibly overzealous Christmas gift list. It's so wonderful to keep yourself inspired, no matter what your passion is. Even if I only knitted blankets for the rest of my life, I have solace in the fact that there are tons of different types of stitches that I can do on my blankets! I could make only a knitted blanket, I can make a cable blanket, I can make a leaf stitch blanket, I can finally figure out those darn gorgeous mermaid blankets! There are so many different things that you can do with one medium that it just keeps inspiring me. I challenge you to find that same drive in whatever your hobby is! There are so many different branches on one hobby tree and, lucky for us, trees are meant for climbing to the top and providing us life. Hello wonderful analogy, because that's what hobbies and creativity are all about! It should make you better and it should give you life! As much inspiration as you're going to find, be sure to measure yourself in what you're going to do right off the bat. You're not going to be able to cable right away and not everything is going to be perfect. Don't beat yourself up if you're having trouble and don't get yourself down. You want to have something to motivate you to continue, not something difficult that's going to discourage you from continuing. Try something simple, like a knitted scarf or even a knitted blanket! Once you get those mastered, work in some purling. Then start to branch out! As I said before, mastering the basics is key. That should be the whole theme of this post. Master them basics! Because once those are under your belt the possibilities are endless! I.LOVE.SPEED.KNITTING. I was learned this as Norwegian Knitting and Purling in my class and haven't looked back since. I would say that was probably the best thing I learned in that class. It is fantastic and so much more fluid than the standard way of knitting. If you don't know what this is, you can check it out on YouTube. The knitting is easier than the purling by far but take the time to learn it! I promise you you won't go back. And those are my words of wisdom! I really hope that they help any of you out there who are beginners or who are losing a little faith in themselves and their knitting skills. I don't want you to be discouraged! I want you to keep going! If it's something that you enjoy then don't give up. Just give yourself time to learn. Keep your head, don't lost your temper like me and rip apart all of your work. Just keep calm, keep cool, and keep inspired! And for those of you non-knitters, I hope this inspired you to keep pursuing your hobby and growing your skills! What are some of your knitting tips and tricks? Are you a fan of speed knitting? What projects are on your needles or on your back burner? Let me know in the comments below! And if you aren't a knitter, let me know what projects you're working on and what tips you have to keep yourself motivated and inspired. And don't forget, sharing is caring!